There's a ton of work to get all these Terminators finished. Since I've sold the bike portion of my White Scars "Doublewing" army (which these guys were a part of...), I can pretty much paint them up however I please now. I've always liked the look of the original Deathwing colors. You know, the black armour with the red chapter insignia. And I've got 2 original MK1 Land Raiders sitting on my workbench too. That should be plenty for a compact, hard hitting force... well maybe a force. Now I need to do some research to find out exactly when the they went to the bone colored Terminator armour. Was it far enough after the Heresy that I can model them with the Crux on the left shoulder pad? Where are your special characters? We know you have made them but they do not show up in the pics. All I need now is a Bannerman to get my deepstriking force ready(and paint lots and lots of paint). Still no land raiders though. Probably start with a crusader since the assault units need to carry Belial so 5 termi capacity does not cut it. Maybe in May. April's hobby budget is already pledge for a new predator for pick up saturday. So many armies so little money. What ever happened to the Sammuel conversion you were doing with the dark eldar jetbikes? I can't remember exactly when it was but the Deathwing re-paint was definitely a good few millenia after the Heresy, so you can leave those Crux as they are. 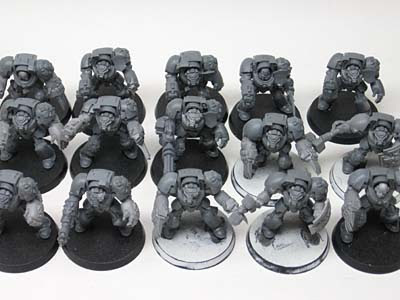 The bone colored Terminators came about as a result of fluff for first edition Space Hulk. A group of terminators returned to a planet that the Dark Angels had been using to recruit from. Long story short; the planet is inhabited by Native Americans. Yes, for a time the Dark Angels were probably all Native American. Anyway, they returned to the planet and found that the tribes had been taken over by a Genestealer cult. They painted their armor white as it was their cultures color of mourning and went on a suicide mission to cleanse their planet. I think one Librarian (Two Heads Talking) might have lived. The rest of the chapter shows up and decides to continue to paint their Terminator suits bone in honor of their bravery. That's how I remember it anyway. I think you are safe with the crux. They changed to bone after one of their recruitment worlds was taken over by a genestealer cult. A librarian and his termie command squad painted their armor bone, the color of death. They then proceeded to purge the entire planet, while waiting for the rest of the chapter to arrive. There was a comic version in one of those inferno compilations a while ago. Anyway, it happened WAY after the heresy since it was after the discovery of the genestealers and the tyranids as a race. You could absolutly use their more retro paint scheme with the more modern armor. Yea you are safe with the crux on there shoulder pads. It was far enough after the heresy. eriochrome: I have my special characters, I just have shown them yet. That Sammael conversion you speak of has never been posted yet. He's a single model I am going to paint and then sell. He's not doing me any good anymore. I'll end up posting the tutorial on the plastic jetbike as well when the time comes. As for the old color scheme/crux worry... I figured I would be alright by a few millenia but I would hate to get them painted only to find out I'm way off in my timeline. Maybe I'll do a "test model" to see how one of them come out. A little bit of a motivator. So, I go to the website on a whim, click the "reply" link on an even more extreme whim, and now have to dig out my ancient Space Hulk set and let nostalgia read the Deathwing stories again.